The word hydroponics comes from two Greek words, "hydro" meaning water and "ponics" meaning labor. The concept of soil less gardening or hydroponics has been around for thousands of years. The hanging Gardens of Babylon and The Floating Gardens of China are two of the earliest examples of hydroponics. Scientists started experimenting with soil less gardening around 1950. Since then other countries, such as Holland, Germany, and Australia have used hydroponics for crop production with amazing results. Hydroponics is proved to have several advantages over soil gardening. The growth rate on a hydroponic plant is 30-50 percent faster than a soil plant, grown under the same conditions. The yield of the plant is also greater. Scientists believe that there are several reasons for the drastic differences between hydroponic and soil plants. The extra oxygen in the hydroponic growing mediums helps to stimulate root growth. Plants with ample oxygen in the root system also absorb nutrients faster. The nutrients in a hydroponic system are mixed with the water and sent directly to the root system. The plant does not have to search in the soil for the nutrients that it requires. Those nutrients are being delivered to the plant several times per day. The hydroponic plant requires very little energy to find and break down food. The plant then uses this saved energy to grow faster and to produce more fruit. Hydroponic plants also have fewer problems with bug infestations, funguses and disease. In general, plants grown hydroponically are healthier and happier plants. Hydroponic gardening also offers several benefits to our environment. Hydroponic gardening uses considerably less water than soil gardening, because of the constant reuse the nutrient solutions. Due to lack of necessity, fewer pesticides are used on hydroponic crops. Since hydroponic gardening systems use no topsoil, topsoil erosion isn't even an issue. Although, if agricultural trends continue to erode topsoil and waste water, hydroponics may soon be our only solution. The purpose of a growing medium is to aerate and support the root system of the plant and to channel the water and nutrients. Different growing mediums work well in different types of hydroponic systems. A fast draining medium, such as Hydrocorn or expanded shale works well in an ebb and flow type system. Hydrocorn is a light expanded clay aggregate. It is a light, airy type of growing medium that allows plenty of oxygen to penetrate the plant's root system. Both types of grow rocks can be reused, although the shale has more of a tendency to break down and may not last as long as the Hydrocorn. These grow rocks are very stable and rarely effect the pH of the nutrient solution. Rockwool has become an extremely popular growing medium. Rockwool was originally used in construction as insulation. There is now a horticultural grade of Rockwool. Unlike the insulation grade, horticultural Rockwool is pressed into growing cubes and blocks. It is produced from volcanic rock and limestone. These components are melted at temperatures of 2500 degrees and higher. The molten solution is poured over a spinning cylinder, comparable to the way cotton candy is made, then pressed into identical sheets, blocks or cubes. Since Rockwool holds 10-14 times as much water as soil and retains 20 percent air it can be used in just about any hydroponic system. Although the gardener must be careful of the pH, since Rockwool has a pH of 7.8 it can raise the pH of the nutrient solution. Rockwool cannot be used indefinitely and most gardeners only get one use per cube. It is also commonly used for propagation. Other commonly used growing mediums are perlite, vermiculite and different grades of sand. These three mediums are stable and rarely effect the pH of the nutrient solution. Although, they tend to hold too much moisture and should be used with plants that are tolerant to these conditions. Perlite, vermiculite and sands are very inexpensive options, and work charitably in wick systems, although they are not the most effective growing mediums. Most of the principles that apply to soil fertilizers also apply to hydroponic fertilizers, or nutrient solutions. A hydroponic nutrient solution contains all the elements that the plant normally would get from the soil. These nutrients can be purchased at a hydroponic supply store. Most are highly concentrated, using 2 to 4 teaspoons per gallon of water. 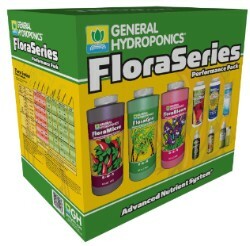 They come in liquid mixes or powered mixes, usually with at least two different containers, one for grow and one for bloom. The liquids are the slightly more expensive and the easiest to use. They dissolve quickly and completely into the reservoir and often have an added pH buffer. The powered varieties are inexpensive and require a little more attention. They need to be mixed much more thoroughly and often don't dissolve completely into the reservoir. Most do not have a pH buffer. Like soil, hydroponic systems can be fertilized with organic or chemical nutrients. An organic hydroponic system is considerably more work to maintain. The organic compounds have a tendency to lock together and cause pumps blockage. Some hydroponic gardeners simply supplement their hydroponic gardens with organic nutrients, using the chemical nutrients as the main food supply. This gives the plants a stable supply of nutrients without the high maintenance a hydro-organic system. Most plants can grow hydroponically within a pH range of 5.8 to 6.8, 6.3 is considered optimal. The pH in a hydroponic system is much easier to check than the pH of soil. Many hardware, pet, and hydroponic supply stores sell pH-testing kits. They range in price from $4.00 to about $15.00, depending on the range and type of test you prefer. 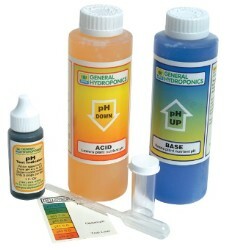 Testing pH is easy and essential in a hydroponics system. If the pH is too high or too low the plant will not be able to absorb certain nutrients and will show signs of deficiencies. pH should be checked once a week. It is easy to adjust by adding small amounts of soluble Potash to raise pH, or phosphoric acid to lower pH. There are also several pH meters available. These give a digital reading of the pH in the system. The pH meter cost around $100 and are not necessary in most cases. Hydroponic systems are characterized as active or passive. 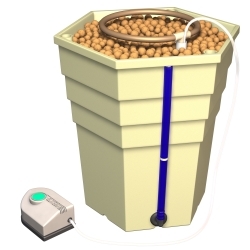 An active hydroponic system actively moves the nutrient solution, usually using a pump. Passive hydroponic systems rely on the capillary action of the growing medium or a wick. The nutrient solution is absorbed by the medium or the wick and passed along to the roots. Passive systems are usually too wet and do not supply enough oxygen to the root system for optimum growth rates. Hydroponic systems can also be characterized as recovery or non-recovery. Recovery systems or recirculating systems reuse the nutrient solution. Non-recovery means just what it says. The nutrient solution is applied to the growing medium and not recovered. The wick system is a passive non-recovery type hydroponic system. It uses no pumps and has no moving parts. The nutrients are stored in the reservoir and moved into the root system by capillary action often using a candle or lantern wick. In simpler terms, the nutrient solution travels up the wick and into the root system of the plant. Wick systems often uses sand or perlite, vermiculite mix and a growing medium. The wick system is easy and inexpensive to set-up and maintain. Although, it tends to keep the growing medium to wet, which doesn't allow for the optimum amount of oxygen in the root system. The wick system is not the most effective way to garden hydroponically. The Ebb and Flow hydroponic system is an active recovery type system. The Ebb and Flow uses a submersible pump in the reservoir and the plants are in the upper tray. They work on a simple flood and drain theory. The reservoir holds the nutrient solution and the pump. When the pump turns on, the nutrient solution is pumped up to the upper tray and delivered to the root system of the plants. The pump should remain on for about 20 to 30 minutes, which is called a flood cycle. Once the water has reached a set level, an overflow pipe or fitting allows the nutrient solution to drain back into the reservoir. The pump remains on for the entire flood cycle. After the flood cycle the nutrient solution slowly drains back down into the reservoir through the pump. During the flood cycle oxygen poor air is pushed out of the root system by the upward moving nutrient solution. As the nutrient solution drains back into the reservoir, oxygen rich air is pulled into the growing medium. This allows the roots ample oxygen to maximize their nutrient intake. Rockwool and grow rocks are most commonly used growing mediums in Ebb and Flow type systems. The Ebb and Flow is low maintenance, yet highly effective type of hydroponic gardening. The Nutrient Film Technique or NFT system is an active recovery type hydroponic system. Again, using submersible pumps and reusing nutrient solutions. The NFT uses a reservoir with a submersible pump that pumps the nutrient solution into a grow-tube where the roots suspended. The grow-tube is at a slight downward angle so the nutrient solution runs over the roots and back into the reservoir. The nutrient solution flows over the roots up to 24 hours per day. Oxygen is needed in the grow-tube so capillary matting or air stones must be used. The plants are held up by a support collar or a grow-basket and no growing medium is used. The NFT system is very effective. Although, many novice hydroponic growers find it difficult to fine tune. It can also be very unforgiving, with no growing medium to hold any moisture, any long period of interruption in the nutrient flow can cause the roots to dry out and the plants to suffer and possibly die. The Continuous Drip system is an active recovery or non-recovery type system. This system uses a submersible pump in a reservoir with supply lines going to each plant. 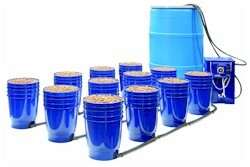 With drip emitter for each plant the gardener can adjust the amount of solution per plant. A drip tray under each row of plants, sending the solution back to the reservoir, can easily make this system an active recovery type. In the early days of hydroponics, the extra solution was leached out into the ground. Continuous Drip systems are often used with Rockwool. Although, any growing medium can be used with this system, thanks to the adjustment feature on each individual drip emitter. This is the most asked question relating to hydroponics. Should I buy one or build one? This author recommends a little of both. If you have an engineer's mind and dream of building your own hydroponic system, buy one first! Getting an inexpensive system will allow you to get your feet wet and give you a better understanding of how hydroponics works. The hands on experience is worth the cost of the system and chances are, you will be able to reuse the parts in that system when you set out to build your own. If you would rather get right into building your own, do your research. Get all the information you can and don't rely on just one source. This is a constantly changing industry and there are many books still on the shelves that are already outdated. Building your own system can be very rewarding or extremely frustrating. It's mostly trial and error so, be patient. Hydroponic gardening is the wave of the future. It is currently being studied in classrooms around the country, local horticultural societies and in government funded research at major universities and NASA. It is also becoming a popular hobby. Hydroponics is fun, exciting and easy to get involved in.